NASA astronauts Tracy Caldwell Dyson (left) and Doug Wheelock prepare spacesuits in the Quest airlock of the International Space Station for their Aug. 6 and Aug. 9 spacewalks in 2010 to repair the outpost's cooling system. Click here for live SPACE.com's livespacewalk coverage and a link to NASA TV to watch the space station repair. Twospacewalking astronauts ventured outside the International Space StationSaturday to begin a major repair job on the outpost's main cooling system. 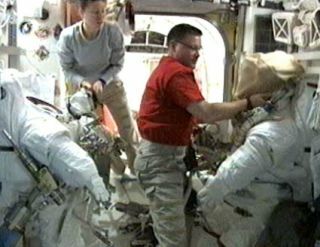 Clad intheir NASAspacesuits, American astronauts Douglas Wheelock and Tracy Caldwell Dyson floatedoutside the station at 7:19 a.m. EDT (1119 GMT) to replace a large oven-sizepump that moves liquid ammonia through the right side of the orbitinglaboratory's cooling system. It is thefirst of two unplanned spacewalks the astronauts will take to complete thecomplicated spacestation repair. A second spacewalk is set for Wednesday. Spacestation managers have said the pump malfunction is a major failure for the12-year-old orbiting lab, enough so that engineers had already drawn up repairplans on the off chance it occurred. The InternationalSpace Station uses liquid ammonia to cool its onboard systems bytransporting waste heat to a network of radiators mounted to its main truss.There are two main cooling system loops ? Loop A and Loop B. The failed pump isin Loop A, while the other cooling loop remains operational. Wheelock andCaldwell Dyson are expected to spend seven hours working to replace thestation's stricken Loop A cooling system pump during their spacewalk. They willphysically remove and replace the pump during the spacewalk, and plan to hookup the new pump's electrical and ammonia plumbing connections during the secondspacewalk on Wednesday. The failedammonia pump is located on the station's right side truss and will be replacedwith one of four spare pumps stored at the orbiting lab. Each pumpweighs 780 pounds (353 kg) and is 5 1/2 feet long (1.6 meters) by 4 feet wide(1.2 meters). They are about 3 feet tall (almost 1 meter). Caldwell Dyson hassaid the pumps are about the size of a laundry dryer. Wheelock andCaldwell Dyson were initially slated to perform a different spacewalk onThursday. That spacewalk was aimed at preparing the space station for future constructionwork. Those tasks have been postponed for now. Saturday'sspacewalk marks the first for Caldwell Dyson and the fourth for Wheelock. Poll: Do We Need a New International Space Station? NASAis broadcasting the International Space Station spacewalk repairs live fromspace on NASA TV. Click here for space station missionupdates and SPACE.com'sNASA TV feed.